In accordance with her name, Caribbean Princess hosts frequent cruises in and around the Caribbean, as well as some other great destinations - but what is she like to travel on? 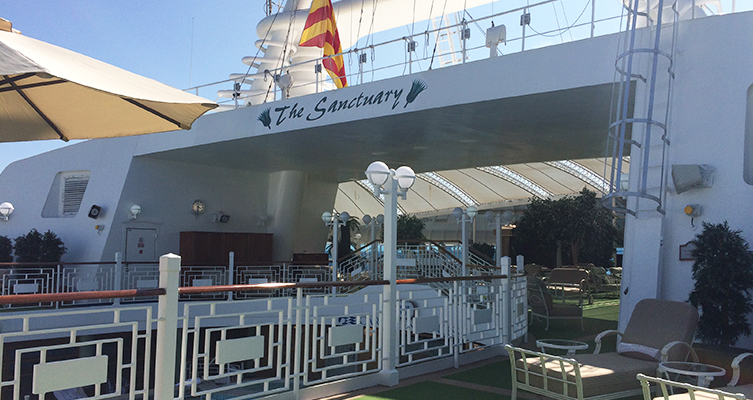 Read on for a helpful review about the style and service on the ship, and all of its features. Kat, our TV Production Executive was fortunate enough to embark on her first ever cruise on a very sunny May bank holiday onboard the one and only Caribbean Princess. The cruise was part of a British Isles itinerary with Princess Cruises where she sailed for three days from South Queensferry in Edinburgh, onward to Le Havre before disembarking in Southampton. Kat was onboard as part of an Academy at Sea program, designed by Princess Cruises to ensure travel industry employees understand all there is to know about the cruise organisation, though it wasn’t all work and no play… Kat tells all about what it was like to sail with Princess Cruises as a first time cruiser. 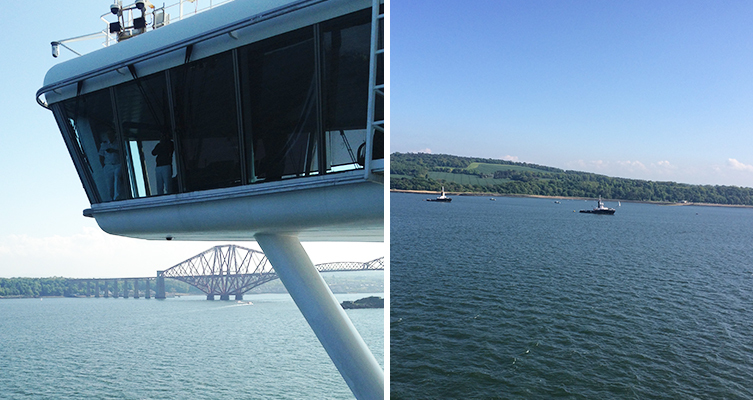 We embarked from South Queensferry, which is about a half an hour drive from Edinburgh. On the day, many of the cruisers who docked in to this port took coaches into Edinburgh and enjoyed the variety of excursions Princess Cruises has to offer in the area. These excursions included a trip to Edinburgh Castle to see the crown jewels and other UNESCO World Heritage sites. We took a tender to the ship, which for anyone new to cruise, is a small boat which transports you from the ship to the shore when a vessel can’t be docked closer to land. I really enjoyed this experience, as you can see far out in the distance for a great view of Scotland’s beauty, and the excitement really builds on your approach to ship. I expected the ride to be bumpier, but it wasn’t too bad! 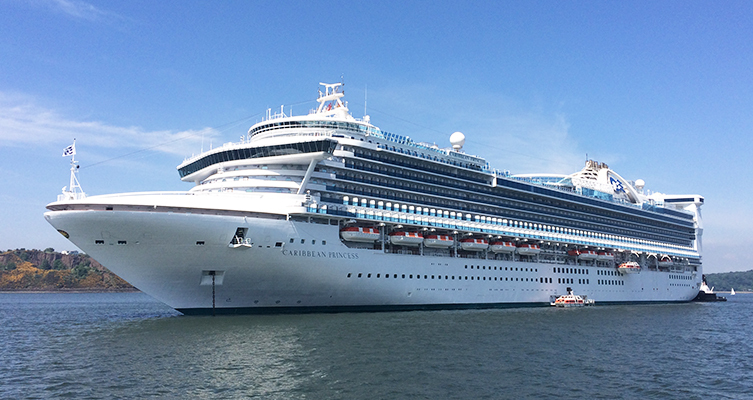 The gorgeous Caribbean Princess is so welcoming that you feel the lovely homey atmosphere as soon as you step onboard. Upon embarkation we were taken on a tour of the whole ship. I had the impression that it was large enough to have all the amenities you would want/need, but small enough to know your way around easily. It definitely seemed intimate enough to find yourself regularly crossing paths with the same people during the course of the cruise. This would be great for anyone who enjoys the social aspects of a holiday. On first inspection of our room, we were pleasantly surprised to see that our stewardess had surprised us with a pamper pack of toiletries and a full mini bar, which by the way, you are able to swap and change if there are any liqueurs not to your liking. The first thing I did when I entered my room was go to the balcony and soak in as much scenery as possible. After all it's not every day you get such a view from your own bedroom, especially when you are fortunate enough to be able to see the captain from your balcony! As can perhaps be expected with a British Isles itinerary with Princess Cruises, the passengers were mostly of very friendly American & Canadian decent. That said, I can’t see any reason why a British passenger wouldn’t enjoy this itinerary given the convenience of cruise travel compared to travelling across the country to each of these places individually. I must have seen only a couple of children onboard throughout the entire course of the cruise, so I would definitely recommend Princess Cruises and a local itinerary to anyone who prefers more of an adult only experience, without potentially having to pay extra for an adult only cruise. I have to say that the speciality restaurants were among my favourite dining experiences onboard Caribbean Princess. We visited Crown Grill, which is a steakhouse that also serves premium seafood - it was here that I had my first taste of lobster, and the best steak I have ever tasted. 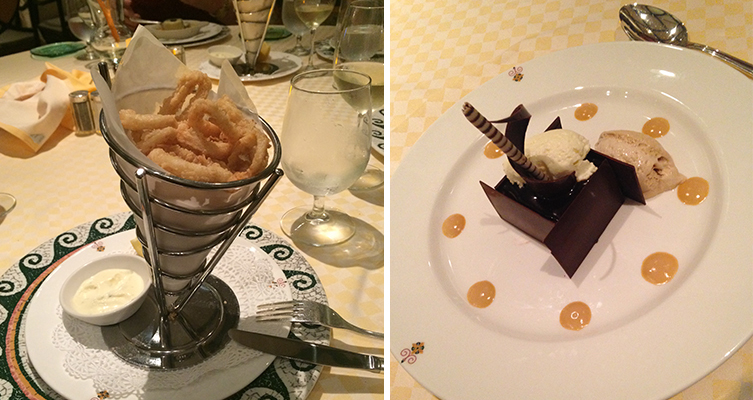 We also dined at Sabatini’s, where I had the most incredible calamari, plus a Norman Love specialty dessert - of which are exclusive to Princess Cruises. Dinner at the main restaurant was exquisite. The great thing about all-inclusive cruising is that you can try new foods without the worry of potentially wasting your money. I used this cruise as an opportunity to try scallops for the first time, and it's safe to say I will be eating them again! One of my favourite little touches onboard Caribbean Princess, was the refreshing lemonade that is prepared onboard with the juice of fresh lemons. This is readily available at all buffet restaurants, and you can even grab a glass and take it around the ship with you if you like. The buffet restaurant was filled with plenty of choices, and the hot food was a good temperature each time I visited. I also enjoyed an afternoon snack at the pizzeria, which prepares freshly made pizza right in front of you - it was good enough to come back for seconds! We had a 9am presentation one morning, so we decided that a room service breakfast would be the best option for us. You simply fill out the room service card and leave it outside your door the night before, and your breakfast will arrive at your preferred time. I had some delicious bacon and egg muffins with coffee and apple juice, which was a fantastic start to the day! One thing that you mustn’t miss out on is the cocktails at Skywalkers Nightclub. 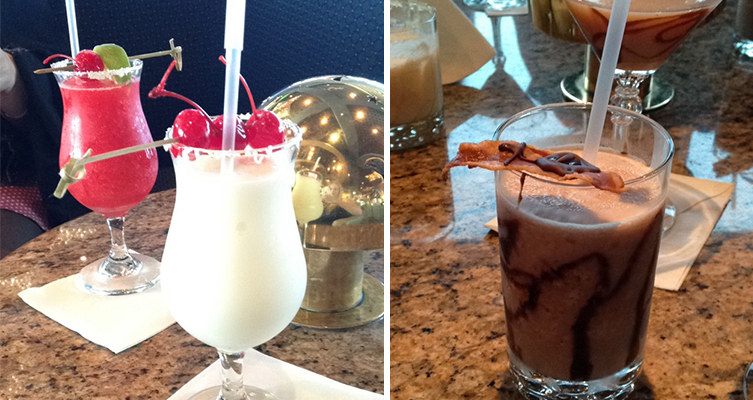 I had a selection of cocktails during the trip, but the Pina Colada was especially delicious. The divine chocolate journey cocktails are also a must! I chose the chocolate and bacon which was a surprisingly good combination. 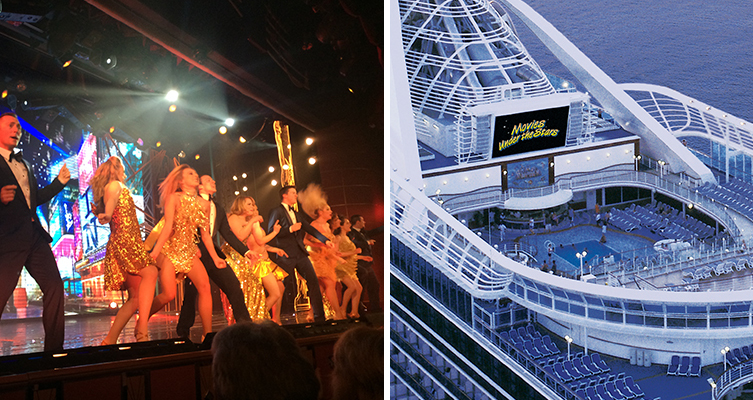 Of the various things to do on the ship, I felt that one of the main highlights was the Movies Under the Stars ®. Here you can relax on a deck chair with popcorn and a blanket, and watch a movie on the 300 square foot screen. While I was onboard the latest James Bond movie was the main showing. I attended an evening show at Princess Theater which was a musical performance of various tunes, including hit songs from Abba. I loved the show and would highly recommend anyone coming along to see the talented cast for an original production at sea! I really enjoyed The Sanctuary - even sitting on the comfy chairs and beds made me feel completely at ease. The swimming pool and Jacuzzi were set at the perfect temperature, and also were never too busy - the pool was even empty on several occasions. We were fortunate enough to have access to areas not normally available to the public - like the kitchens, and more importantly, the Captains Bridge! 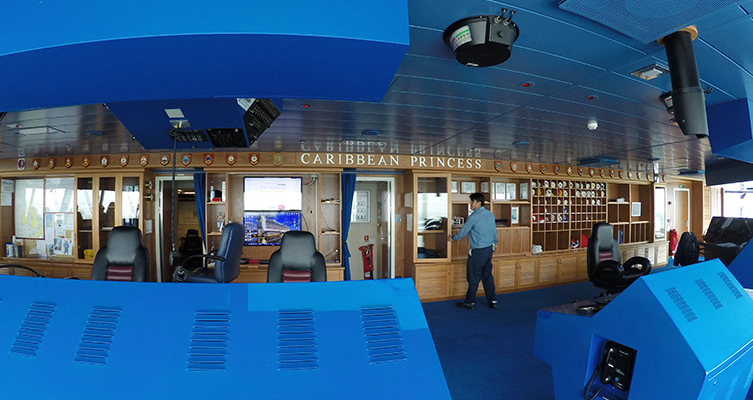 Read more about our Princess Cruises Behind the Scenes Tour for exclusive details. What can I say. Princess Cruises were amazing hosts, and the attentiveness and friendliness of staff was just something that is hard to put into words. It's the service I received that really puts this cruise holiday experience on another level, compared to package holidays where you would normally need to pay a premium price for the same level. After a fantastic experience I am definitely without doubt a cruiser, would thoroughly recommend Princess Cruises, and encourage anyone who has never cruised before to take the leap. Discover more about the incredible itineraries available on this ship, and consider a Caribbean Princess cruise in the Caribbean.